The book was now in production at MacMillan and it would be a year before we would see bound copies of The Way Home. There was a lot for the publisher’s staff to do; select and set the type, write the book jacket flaps, prepare the pages for the printer and arrange the printing in Hong Kong. Judy and I were so excited to see the first printing proofs. We felt this was also proof that our years-long project was really going to become a book! I learned that producing a book is a lot more complicated than one might think. Everyone involved, the writer, the illustrator, the editors, the production staff and the sales department all play an important part. I was also impressed that everyone I met during the process truly loved children’s books. 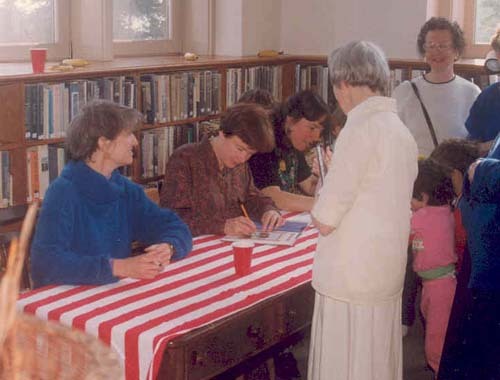 In the spring of 1991, boxes of The Way Home arrived and Judy and I celebrated its publication at the Woods Hole Library, with a party and book signing. You can see an earlier post about the library quilt I worked on here. We shared the event with Molly Bang, whose book, The Yellow Ball, was coming out the same spring. Our friend, Terry (who gave me her daughter’s pants) made a cake for the occasion. She decorated it with marzipan elephants and a yellow ball made of frosting. We were so proud of The Way Home and did what we could to promote the book. We had our picture taken with an elephant that came through town for the county fair. We gave talks, did book signings and visited schools. Judy led banana poem workshops with children and I’d have them sew and stuff yellow felt bananas. Our book did pretty well for an unknown author and illustrator and came out in paperback the next year. Later, Judy and I collaborated on a sequel, Come to My Party, which MacMillan published in 1993. In this book, the red bird character is named Harold and co-stars with Savi in another adventure. Both books have long been out of print and I can remember how surprised Judy and I were to get the letter telling us the news. Being new to the book business, we did not know how common it is for children’s books to go out of print. We’ve since learned that only the very best sellers are reprinted and stay available. All in all, the best part about publishing a book was when we heard from parents who said their children wanted The Way Home read over and over. Even today, we meet grown up children who remember Savi and the banana trail. 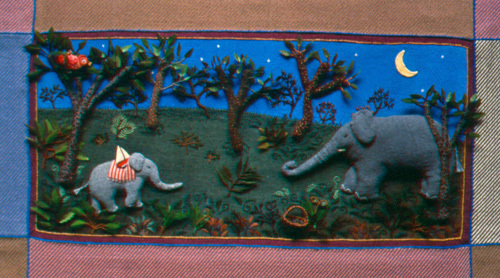 I’m still friends with Judy and Molly and am grateful to have had their help and encouragement throughout the years, but especially in the beginning, 27 years ago, when we all were inspired by a little elephant named Savi. Please enter me! I love reading your blog. I’ve made over 30 of my own “Felt Week Folk” and love them! Whenever I see a post from you I click on it immediately knowing that my spirits will be lifted and I will be inspired. Thank you so much for sharing your work and your journey. How about another book from you with more of your wonderful little dolls and other creations? Hello Salley~ I have truely enjoyed learning the process that goes into publishing a book. Especially this book as elephants have always been a special love of mine(since I was 5 years old). Your work is so expressive and makes me want to try making a 3-D relief illustration. I have started to collect your books and find great comfort when I look at the illustrations. Thank you for sharing your wonderful talent to both the young & old. I’ve enjoyed this tale of your first book. I remember the excitement of my first book, a chapter book and then my first picture book. Salley, I’ve enjoyed reading about the journey of this little book and of your career along with it. I still have 3 little fairy dolls from kits I bought from you years ago. I made one as did both of my daughters; the funny thing is that they actually resemble us. Looking forward to more inspiration from your blog. You can never have enough Salley Mavor books! Count me in! I’ve enjoyed every bit of your journey. Would love the book- 8 grandkids to read it to! Thank you for sharing this with us! It was so interesting to read and The book looks so cute. I have 4 children and we would love to win. Salley – prize or no – I would not have missed these posts. I cannot even imagine the detail and love that went into this project. Outside of seeing the pages in print – I could only desire to see the actual work. The details are breath-taking. Thank you for thinking to sjare this with us. It has been a joy! Thank you! I have enjoyed reading your blog since finding it about 2 weeks ago. I love illustrations done with fabric and have your book about making fairies. Lovely figures. I’m ksorry I never saw you elephant book but I will definitly look for it as I go through thrift stores. I would love to share the story with my grandsons; I have 5 and 1 on the way. It would get ready many many times. I have truly enjoyed reading about your journey. Not only reading about it but seeing the drawings and how they came to life! You really are an inspiration to all of us! Would love to be able to read this book to my grandchild. It is such a sweet story and of course I adore your illustrations. I bought your Felt Wee folk book long before I saw a post about your other work on Mimi Kirchner’s blog. And when she let us know you started your own blog I have been following it since the beginning. I so enjoy reading about your work and looking at the amazing pictures. I even entered the Felt smack down organized by Patty Gasparino and enjoyed making my own fabric background for my own Wee elf. And it made me appreciate how much work and craftmanship goes in to your fabric reliefs. I’m a big fan and I would love to own a signed copy of your very first book! Thank you for sharing your journey. Although I only recently discovered your work (and blog) I’m now an avid reader and appreciate the inspiration you provide. It’s great to read all of your comments! I’ve been wanting to write this account for a long time and it took a broken wrist to keep me at the key board and away from a needle and thread. I’ve just started sewing again, so we’ll have to see how the blogging/sewing balance unfolds. Thank you for following this and my other stories! Pick me! pick me! But if I don’t get lucky . . . I’m going to have to go on a search for the out of print books to complete my Salley Mavor collection. I loved this post, Salley, and as pleased as I am to hear that you’re feeling well enough to sew, I’ll be sad if it means your blog has to slow down. I find that it’s a really hard balance — blogging takes a lot of time, and I love it so much that my sewing has suffered a little, but that may be because I always intended to be a writer. But I’m sure you’ll be able to find a pace for both that works well for you. And many thanks, again, for this great story! I’m in- I love Savi! This was a great series- what an amazing journey. I’m a new fan, and enjoy your discussions of your work and the wonderful images. Your comments on the production process of this book were especially interesting to me. It’s so sad that so many wonderful books go out of print. You have been a huge source of inspiration to my daughter (she is your first commenter on this post), and I’d love to win this book for her. :o) (Pick me. Or her.) Thanks for the wonderful opportunity to get your book! Hi, Salley – I admire your work and find such creative inspiration in it. Thanks for making these treasures available as a give-away. As an aerist working in fiber, I find it most inspiring. And I don’t believe you need to be a child to love children’s books; I had a collection for years before I had children. It would be an honor to win your books! Best wishes for full broken-wrist recovery. How wonderful it must have been when the book came out! I could feel your excitement. That cake was amazing. What fun! You have good friends and it must have been absolutely wonderful to have the book published and to share the moment. When the book came I bought it for a gift and am sorry I didn’t keep copies for myself. I once taught your “wee folk” to groups of ladies at my doll club. They all remembered your books. This has been a really nice visit learning about your publishing process. Thanks so much! If I won a book, I would be quite happy. I admire and love your work. I’ve so enjoyed reading about the process of creating this book! I’ll deinitely keep an eye out for it; my granchildren would love to read about Savi. Please enter me for a chance to win a copy. What a wonderful story. I have enjoyed it so much and appreciated your hard work and creativity. I am a lover of books. Count me in! I treasure good stories, particularly those that have been paired with art that inspires the creativity of the onlooker or reader. The story of this book’s creation has been a wonderful exploration of a complex shared process. Thanks for your work–and your blogging! I am so glad you have started this blog. I have loved your work for years and have a file in my computer with just your ideas. I have been working on the Wee Folk book. I have all the parts cut out, just still not satisfied with my wrapping technique. Your three dimensional art is so unique. I don’t know why elephants seem so empathetic to humans, but they touch the heart. I love your work and your blog. This book is so wonderful I would love a chance at having my own copy! It’s a shame that so many great children’s books go out of print. Salley, the details in your writing match the work that you goes into creating your beautiful illustrations. I really enjoyed reading the journey you took in creating of your first book. It’s inspiring that you’ve been able to followed your own direction in art and have made a career out of it (while having a family, too). Thank you so much for taking the time to write such an interesting, informative blog. Add my name to the lottery! Salley, I loved following your story – what a treat! I am fortunate to have my own signed hard cover “The Way Home” so please don’t enter me in the drawing. I just wanted to pop in and say hello. I love your blog – it’s such a delight and inspiration, just like your artwork! Life has kept me away from blogs for some time, and today I finally had a chance to read the story about the creation of “The Way Home”. What an experience! I really enjoyed reading about the process and especially apreciated the photograph of you with some of the illustrations behind you on the wall. I kept wondering about the scale of the work and that photo was helpful in getting a good perspective on the size of the art. Wonderful! Thanks so much for sharing the story.